A very common concern is the lines moving outwards from the outer corners of the eyes. 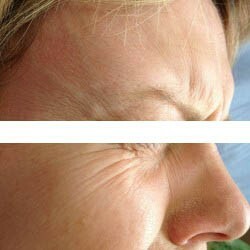 We can treat these lines very effectively and this is one of the most satisfying issues to treat! Treating both Crow’s Feet areas of the face, counts as ONE area on our pricing menu for BTX-A. Facial expressions such as smiling and squinting (e.g. in the sun) can lead to these lines forming over time. 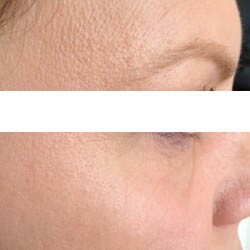 BTX-A anti-wrinkle injections are a safe and highly effective method of significantly reducing the appearance of these lines and often takes them away completely. Deeper, static lines (apparent with relaxed muscles), can be treated with hyaluronic acid fillers. 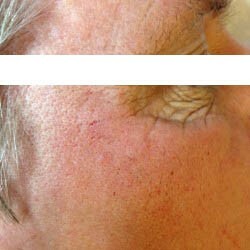 See our before and after images of some of our clients who have had both types of treatment. Botulinum Toxin-A (e.g. Botox or Bocouture) remains the number one anti-ageing treatment, primarily used for PREVENTION & TREATMENT of lines & wrinkles. We aim to give you a natural result; we do not support the frozen look. We also use this for other concerns eg armpit sweating, teeth grinding/TMJ pain and migraine. A safe and effective product used by millions of patients. In our experience, “Botox” is still very misunderstood, even amongst patients who have been having it for some years. We often hear in consultation that “no-one has ever told me that when I have had Botox before!” Let us introduce you to a truly expert approach to this popular treatment. Botulinum Toxin A is available in a number of different brands. We offer two of the leading brands Botox and Bocouture, at the same price. A number of high quality, double-blind, randomised, controlled, split-face trials have shown that effectiveness and duration of effect are equal with these 2 brands. However, with a heavy emphasis on practising evidence-based medicine, our strong belief is that Bocouture is now the Gold Standard product to use. The main reason is that it is the only brand which does NOT contain complexing proteins. These proteins can be responsible for the immune system mounting a response that produces antibodies, rendering the treatment ineffective. Incredible advancements in filler technology combined with the team’s 20 years experience with fillers, allow us to address a wide array of concerns. This includes age lines, volume loss (often ignored! ), smoker’s/kiss lines and thin lips. Our speciality is to design a personal plan to make small subtle changes at multiple areas to create a significant but natural looking result. The Derma FNS™ skin remodelling system (detailed below); particularly useful for more significant scarring as well as other conditions. Derma FNS™ results are comparable in effect to ablative treatments such as Fraxel, IPL and Laser Resurfacing but at a fraction of the cost and with much less downtime and minimal damage to the integrity of the skin. Skinade™ is a multi-award winning, natural peach and mangosteen flavoured anti-ageing collagen drink containing a patent pending formulation of active ingredients that boosts your body’s natural production of collagen and hyaluronic acid and improves the way your skin looks and feels in as little as 30 days. Skinade™ has been developed by leading UK scientists and is designed to provide a perfect ratio of liquid to active ingredients to create one of the most advanced, effective and bio-available anti-ageing skincare products on the market today.